WARSAW, Poland (CNS) — Czech government officials and former dissidents marking the 25th anniversary of their country’s “Velvet Revolution” gathered with church leaders in Prague’s St. Vitus Cathedral Nov. 15. The church leaders include a man, now cardinal, jailed under communist rule, and another, now a bishop, also jailed — he later became one of the top leaders of the Czech dissident movement. But although the part played by the Catholic Church in the overthrow of communism has been detailed by countless books and studies, some Western commentators and historians appear unwilling to acknowledge it. “We know a great deal now about how the church, led by Pope John Paul II, helped disseminate a doctrine of human and civil rights when Marxism was losing its attractiveness,” said Jan Zaryn, a Polish historian who specializes in church history. “But interpretations of this period still seem heavily colored by ideological preferences …. Quite apart from its factual inaccuracy, this suggests a primitive understanding of recent history,” Zaryn said. He added that many Czechs, Catholic clergy included, had already paid heavily for resistance since the 1948 communist takeover. “These events didn’t not fall from the sky or happen by themselves,” Cardinal Duka told those at the Prague Mass. The church leader had good reason to pay tribute to Catholics. In what was then Czechoslovakia, the church spawned a network of underground groups that became a mass opposition movement in the 1980s with the explicit backing of then-Cardinal Frantisek Tomasek. Practicing Catholics such as Vaclav Benda and Dana Nemcova played key roles in the Charter 77 human rights movement and helped forge common values and aims with liberal and ex-Marxist dissidents. So did influential priests such as Jesuit Fathers Josef Zverina and Frantisek Lizna. Vaclav Maly, now auxiliary bishop of Prague, was jailed and beaten as a dissident and sat at the side of future President Vaclav Havel in final talks with the communist regime. The Catholic Church played a major role elsewhere, too. In communist-ruled East Germany, the church never adjusted its diocesan boundaries to the new state’s borders and consistently boycotted state ceremonies. In Hungary, Catholic base communities formed a key element of a nascent civil society emerging in the 1980s. In Romania, where the 1989 “Winter Revolution” was sparked by the arrest of a Calvinist pastor, Laszlo Tokes, much-persecuted Eastern Catholic priests and laity had been active underground for decades. They also were prominent in neighboring Ukraine, where the Ukrainian Catholic Church, outlawed and officially suppressed by Soviet rulers in 1946, revived in the 1980s with hundreds of secret priests and nuns and became a rallying point for pro-democracy campaigners. In Lithuania, where the Chronicle of the Catholic Church, edited by clergy, became the Soviet Union’s longest-running underground journal, church leaders provided key moral support for the Sajudis democracy movement. It was in Poland that the church’s contribution proved most decisive, in helping sustain pressure for human rights and legality when the Solidarity labor union was crushed under martial law in December 1981. As the only independent nationwide organization, the church offered sanctuary to a host of groups, publications and initiatives. In 1989, it was represented in all key negotiations, mediating at the request of both sides. Analysts say the year’s Round Table accords, which paved the way for a peaceful transition to democracy, might still have happened without the church, but they would have proved more difficult without the church’s authority. 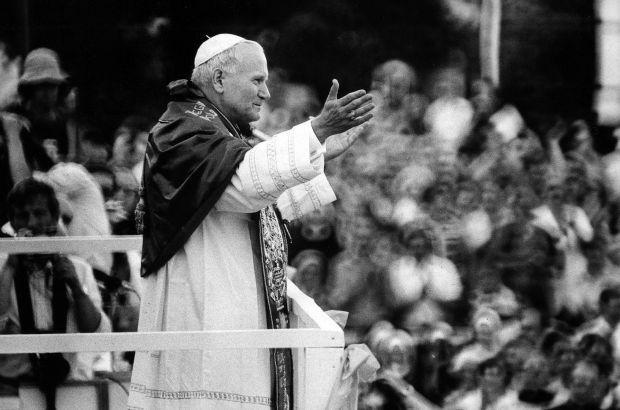 His groundbreaking 1979 Poland visit, with its famous appeal, “Do not be afraid,” is generally acknowledged to have set the scene for Solidarity’s emergence a year later. In a May 2000 survey by Warsaw’s Public Opinion Research Center, 58 percent said the pope’s October 1978 election had been the century’s “most important event,” while three-quarters believed his “influence on the world’s fate” had been greater than any other modern-day figure. Archival research has since revealed that the Catholic Church, even in Poland, was heavily infiltrated by communist informers, and many priests and bishops were compromised by collaboration. However, Zaryn said he thinks secret police penetration cannot detract from the church’s wider role as a promoter of freedom. Today, Russianists stress the role of Soviet ruler Mikhail Gorbachev’s “glasnost” and “perestroika,” U.S. enthusiasts highlight the contribution of Presidents Reagan and George H.W. Bush, while supporters of the European Union emphasize the part played by the continent’s institutions. The religious contribution may have been better recognized by communists themselves, who appeared well aware at the time of the dangers posed to their rule by an assertive Polish pope and new-born Catholic militancy. In Catholic News Service interviews, Poland’s communist strongman, Gen. Wojciech Jaruzelski, recorded how the pope’s teachings had “reawakened hopes and expectations of change.” Gorbachev spoke of how St. John Paul had helped his own “understanding of communism” and acknowledged that the end of communist rule would have been “impossible” without him. “Much of this is still being misunderstood in Western media and academic circles, where the Catholic Church is seen as an oppressive institution, not as a protector of human rights,” Zaryn said. “Communist rule was brought down, first and foremost, by global forces, including loss of the arms race and failure to compete with the Western free market. But the pope and church helped demonstrate that communism was unworkable and ensure those responsible for this criminal system were treated mercifully,” he said.